888sport NJ Review 2019 | Discover 888sport new Welcome Bonus! 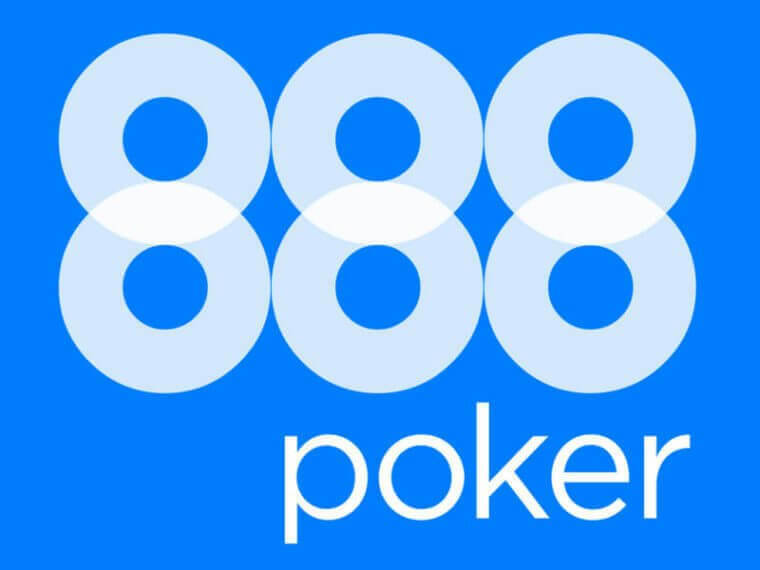 US bettors who reside in the New Jersey have a lot to look forward to because 888sport has decided to bring its players a new sign up bonus. By using 888sport sign up bonus you can claim a $10 no deposit bonus which you can use to try out this brand’s online sportsbook platform without depositing any funds. (T&C Apply). How to register to 888sports betting? 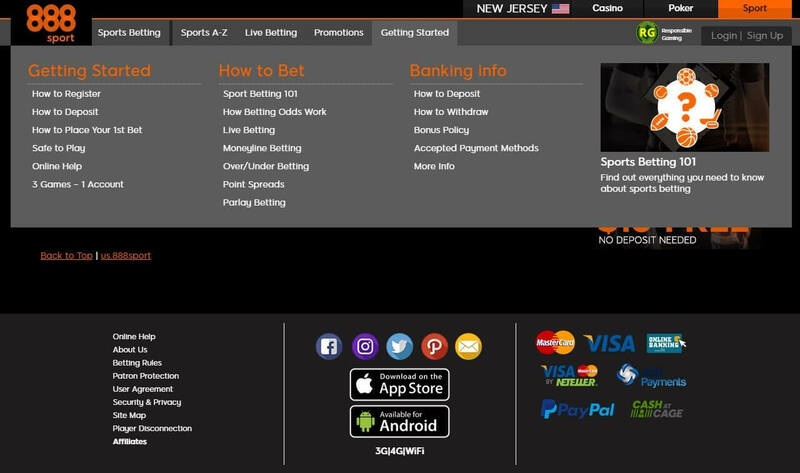 How To Bet In NJ With 888sport? This operator has just started working in New Jersey earlier this year and we can already see that they are taking a good care of their US players. They are now a fully licensed online sportsbook in NJ. 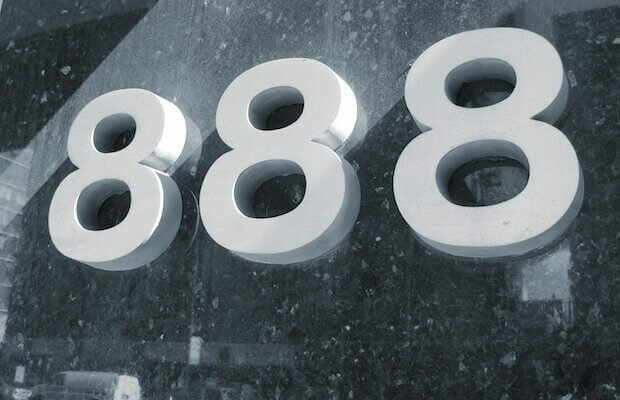 The 888 sport has already proven itself as a trustworthy sportsbook in Europe and other parts of the world. At the moment there is no specific 888sport promo code that activates this welcome offer but keep reading this review as we will explain to you how to claim the 888sport bonus! Since this welcome bonus is for new customers only, you will need to register a new account at their site. Usually, this can be a very boring task for so many players, but we were happy to see that this brand’s sign up process is a well organized and saves you a lot of time. Visit their site and click on a sign up button. A registration form will open up to fill in all the required fields. Finish all the steps to complete the sign up process. Use the welcome bonus within 5 days of creating your account. (T&C Apply). Believe it or not, the $10 no-deposit bonus is not the only welcome bonus this brand has provided to its NJ customers. If you use your no-deposit bonus and decide to deposit your funds in order to keep betting, the 888sport bonus will provide you with a 100% match on your first deposit, all the way up to $500. (T&C Apply). This means that if you deposit $100, this operator will match your first deposit with a 100% and you will get an additional $100 which makes it $200 in total. The maximum amount that can be matched on a first deposit is $500. (T&C Apply). After you register for a new account, placing a bet with 888sport is a very simple thing to do. You can choose between numerous daily sports events that are nicely presented on the home page. The sports games are divided into categories by the leagues or sports categories like basketball, bowling, boxing, football, F1, Nascar, etc. And if you like to bet while the event is still ongoing, this online betting platform has a Live Betting feature which lets you as a player choose from all the sports events that are happening at the moment of visiting their site. Keep in mind that with the live betting feature comes dynamic odds that change depending on a current state of the game. Since the majority of the online betting community prefers to use their mobile devices to place their bets or track their favorite sports events, it makes sense that an online betting platform creates its own mobile app. At the moment of writing this review, this betting platform mobile app is only available for Android devices while their iOS app is in the development process. Being that they are a new operator on this market, it is normal that these additional features are still in the development process but we expect them to be fully available in the future. Most online bettors prefer bookmakers who provide various payment methods. Having a lot of options when it comes to depositing and withdrawing funds says a lot about the quality of operator’s customer service. When it comes to this specific brand, it doesn’t support that many payment options but those few are the most common payment services in this industry. On the other hand, you can only deposit with Visa, MasterCard, Online Banking Transfer, and PayNearMe services. After you create a new account and you are logged in, click on the Cashier button and then choose Deposit. From there, you will need to choose one of these payment options that we talked about. After that, you will need to follow the instructions on how to finish the deposit process. Withdrawing your funds is very similar to depositing them. Once you click on the Cashier button, choose Withdrawal. After that, you will be provided with a form where you need to enter the amount that you wish to withdraw along with the payment option that you want to use. For more details regarding the withdrawal process please read 888sport Withdrawal policy. Please keep in mind that depositing and withdrawing funds can involve some additional costs and fees, so read their terms and conditions carefully. Having a good customer support service is a very important part of every online betting platform. Players can also look at the most popular FAQs and save some time searching for answers if their issue is a common one on this betting platform. In the end, if nothing else can help, a player can always contact their customer support team which is available 24/7 via an email form on their site. It seems like this online sportsbook is really trying to go big on the US betting market. With two welcome offers that we previously mentioned and all the features like live betting and an extensive customer service, this brand really deserves a good rating in our book. This sports betting platform is in addition to the 888Poker app which is also available for download.